Be afraid, be very afraid...a century of cinema nightmare with John Landis, in ePub format for iPadFrom B-movie bogeymen and outer space-oddities to big-budget terrors, Monsters in the Movies by horror film maestro John Landis celebrates the greatest monsters ever to creep, fly, slither, stalk or rampage across the Silver Screen. Feast your eyes on a petrifying parade of voracious vampires, flesh-eating zombies and slavering werewolves as Landis explores the historical origins of archetypal monsters. 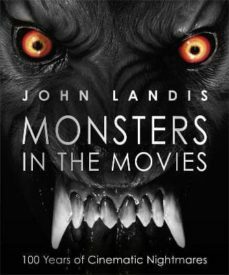 Now in an ePub-friendly condensed format, Monsters in The Movies is filled with the authors own fascinating and entertaining insights into the world of movie-making along with contributions from some of the worlds leading directors including Joe Dante and Guillermo del Toro, actors and special-effects wizards. Illustrated with movie stills and posters from the unrivalled archives of the Kobal Collection, the book will keep you entertained right until the curtain comes down. Get ready to sit on the edge of your seat - Monsters in the Movies is a gripping read.